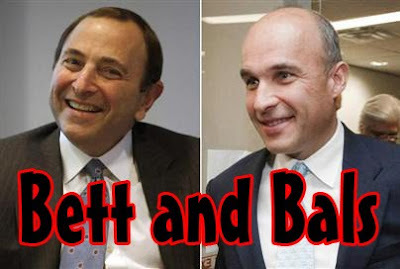 Everyone's favorite tin-foil hat wearer THN columnist Ken Campbell revealed in a piece today that the Tampa Bay Lightning could have traded Vincent Lecavalier to the Montreal Canadiens in June, but because part-owner Len Barrie refused it, Gary Bettman blocked the deal. Sources say there was a deal in place last June to trade Lecavalier to the Montreal Canadiens for goalie Carey Price, center Tomas Plekanec and a prospect, but the deal was blocked by Bettman after Barrie refused to approve the deal. That caused a rift between Barrie and Koules that continued to fester and, combined with the financial problems both owners were having, put the Lightning in a state of flux. Okay, now with the ABSURD amount of trade rumors with Lecavalier now (Campbell in the same piece saying the Kings are the front-runners; who seem to be front-runners for every big name now), this will only make them coming more and more if the Bolts are indeed sold to hedge-fund manager Jeffrey Vinik. Yet, the trade that never happened that many wanted to happen is one of a head- scratcher, at least to me. You have to wonder why someone like Barrie would block the deal, especially when they saw the emergence of Steven Stamkos first hand. It's a deal that would have made sense too, with the Bolts getting a bonafide number one goalie and not just back-up by committee they have going on now; to see which back-up is playing better to get starter's time. Price would have been out of the eye of the Montreal fire-storm and be able to flourish the way he would want, Plekanec would have been a solid depth player and secondary scorer, and Lecavalier would have been in his home and would have probably thrived under the pressure in Montreal....or crumbled-- either way. Though, if that was the start of the ownership issues in Tampa, why would Barrie want to go down with the ship the way he did?? Sure, Lecavalier is the captain, but at the same time-- you need to know what is best for the team when things are planned out that way. It was a benefit to both parties, but Barrie didn't seem to see the forest for the trees; it would seem. Many would say Barrie is a good hockey guy, but this move makes you wonder who has been saying that. When you can get a top goalie and decent secondary scoring-- you could have been better off in the long-run by getting rid of the top dog and hoping the next in line can live up to expectation. You have to risk a lot to get a lot in return. Sport is all about potential since there aren't many sure things. This would have benefited both teams and Barrie effed it up. Of course, all speculation since these are "sources" putting out the story-- yet Campbell, as critiqued as he may be in one form or another, is somewhat trustworthy when things of this nature pop up. It seems plausible too, given that Barrie seemed to be the one going crazy with ideas in the ownership partnership, thus blocking this deal for one reason or another isn't far fetched. Either way, we'll see if Lecavalier does in fact get put on the block if the ownership deal is pushed through-- whether it's this year, this summer, or even at all to this point. It seems Vinny has been traded plenty of times in his career, but still remains in Tampa. In the last installment, we talked about the first artificial rink in Baltimore, as well as a game to go with it. However, the rules had already been understood by the participants of the game; but not so much the fans in attendance. Also, while Baltimore had plenty of club teams playing the game; down the road a ways in the Nation's Capital of Washington, D.C.; the hockey trend was just starting up. 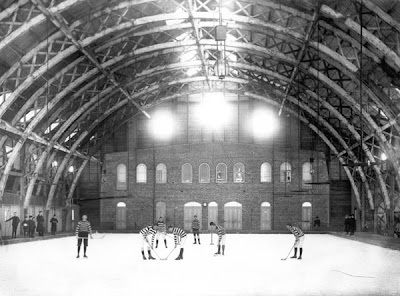 Not to be outdone by their neighbor up north, the DC area built their first rink, the Ice Palace at Convention Hall. The DC scene was just starting to get into the hockey craze, as they had seen how well it caught on with the club teams in Baltimore. Yet, the area wasn't accustomed to the rules-- even though they had an exhibition set up for four days after the article was published on January 29th of 1896 (February 2nd, for you people not feeling like adding) between Washington and Berkley, two teams from Northwest DC thrown together. So, rather than throw the teams out there with no direction, the owner of the Ice Palace, Manager Towers (yes, that was his name, folks), mailed the Secretary of the Amateur Hockey Association of Canada to get said rules. Below are what were returned to Towers, then published by the Washington Post and you get it bit by bit-- with my commentary below it. A team shall be composed of seven players, who shall be bonafide members of the clubs they represent. No player shall be allowed to play on more than one team in the same series during the season, in case of bonafide change of residence. So, to start-- the seven players were very common; the goalie, two defensemen, two wings, a center, and a cover-point or rover. The ideal of switching teams in the season should be something instilled today. In any case, it seems like it's the status quo for today's standards; sans the rover-point. The game shall be commenced and renewed by a face in the center of the rink. The puck shall be placed between the sticks of two opponents and the referee then calling "Play!!" This way is very much like modern-day lacrosse, which hockey has been closely related to since the sport started. Though, try to do that in today's game, jockeying for position and all the unfair face-offs; it could create much havoc and much impatience abound for it all. The rink must be at least 112 feet by 58 feet. Goals shall be six feet wide by four feet high, and shall be placed ten feet from the edge of the ice. Odd how the size of the nets have never changed in hockey, even 110+ years after the game has started. The size of the rink, however, were amazingly small. With that size rink and more players on the ice, it could have been more congested than trap hockey with a 200 by 85 size rink. Two half hours, with an intermission of ten minutes between, shall be the time allowed for matches. A match will be decided by the team winning the greatest number of games during that time. In case of a tie, after playing two specified half hours, play will continue until one side secures a game; unless otherwise agreed upon between the captains before the match. Goals shall be changed each half hour. Of course, each goal is considered a "game" in this instance. Though, unless the captains decide before the game of any kind of limit-- an exhibition game could turn into playoff hockey with the amount of play between goals. Seems a bit much, but that's the old days for you. The ten minute intermission seems very briefs, even in those days; especially with the smaller surface and more players. Though the idea of 30-minute halves is something intriguing to me. No change of players shall be made after a match has commenced, except for reason of accident or injury during the game. Should any player be injured during the match, and compelled to leave the ice, his side shall have the option of putting a spare man from the reserve to equalize the teams. In the event of any dispute between the captains of the teams as the injured man's ability to continue the game, the matter shall be at once decided by the referee. Basically, this is NHL '94 with no line changes in it. You want to talk about iron-man hockey; this is it. The thought of no line-changes nowadays only exists in beer league hockey, where Sully has to look after the kids because the wife is sick. Interesting how another team's captain can dispute the claim of the injury. This is not a time where Mike Ribeiro would be able to play in. When a player hits the puck, any one of the same side, who at such moment of hitting, is nearer the opponent's goal line, is out of play and may not touch the puck himself or in any way whatever prevent any other player from doing so, until the puck has been played. A player must always be on his own side of the puck. The puck may be stopped, but not carried or knocked on, by any part of the body. This is much like the soccer offsides, where a player cannot touch a puck if they are ahead of the play. Wonder how long before the forward pass was instituted. Also, like the idea of the non-tips being into effect. No player shall raise his stick about the shoulders. Charging from behind, tripping, collaring, kicking, or shinning are barred, and any player, after having been warned by the referee, may be ruled of the ice for that game or match, or for such portion of playing time as he may see fit. The refs were the end-all, be-all and with that power-- only imagine how they wielded the power. Plus, if you had a crucial member being sent off, who knows how long you could be without him. The goal keeper must not, during the play, lie, kneel, or sit upon the ice, but maintain a standing position. The perfect time for Kirk McLean. Yet, we've had two old-school hockey ideals of the NHL '94 non-line-changes and the bubble hockey goalie of not being able to move. Goals shall be scored when the puck shall have passed between the goal post from in front, below the imaginary line across the tops of the posts. So, while earlier it was mentioned the goals were six by four, there was really not top. We get into a rugby situation where you only have two post out there. Think of the disputes if someone though the shot was too-high. The video replay would have taken forever. The captains of the contesting teams shall agree upon a referee and two umpires (one to be stationed behind each goal), which positions shall not be changed during the match. All disputes on the ice shall be settled by the referee, and his decision shall be final. All questions as to games shall be settled by the umpires and their decisions shall be final. Very interesting that the captains were the ones to pick the refs, which is something you could never have today because some guys would never see work....looking at you, Kerry Fraser. But again, showing how much power the refs and umpires had in that time and still got some kind of respect. There you have it, the first set of rules published in 1896. While much has changed, many things have stayed somewhat the same. At least the basis for it all was set out and made the proper evolution to mold to the game we know today. For those wondering, Washington defeated Berkley 1-0, but the game was only one-half long. It seems that Carey Price's fall from grace continues, now with news coming out that Andrei Markov has called out Price and questioning his heart and his dedication to the team. From playoff failure to Tweets from his tandem partner's agent-- the pressure on Price to overcome this, even while he's still in a developing issue in his career; is immense and who knows if he can do it in that market. It seems Elliotte Friedman agrees with this ordeal, as does Sean Leahy when he talked about this, which oddly enough sparked my whole thought process. Granted, my thinking was sparked when I heard about the Markov spat in the locker room through Twitter and I was talking to the girl (go check out I Mean, We Got Guys....., by the way) about this. You have to wonder what would become of Price if he wasn't picked where he was picked and if wasn't as good as he was in juniors. Had he been in a lower-pressure market, would he have developed to a bigger name, albeit in a longer time frame?? We all know that goalies take the longest to develop, so was Price brought up too quickly, even given his success in the lower-levels. Yet, it would have been a catch-22 in most cases, as more often than not, Price would have been selected by a team with a big goaltending issue-- hence why they would have picked a goalie so high in the draft. Now, if we do a what-if and Price was selected fifth overall again, he'd probably would have ended up with Phoenix or Columbus, depending on where the lotto balls fell. Either way, those are two teams who have had goalie issues in the past. Odds are, they could have ruined Price off the bat by throwing him in the fire too quickly, but it doesn't seem like they would have been in a big rush in order to get him through the system and up to the pros in a time quicker than the speed of light. Odds are they would have developed him better and allowed him to grow. Again--at what point does he get sick of waiting, thinking he's better than he is and lose confidence for not being called up. It's a tight-rope walk, nowadays. 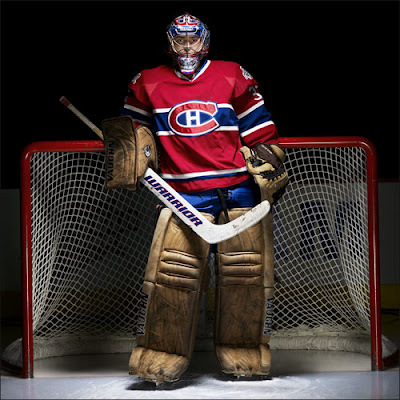 Even if the Habs let Price go, what team would be willing to pick him up?? With goaltending as tight as it is, there's little room for anyone out there. Especially considering his slump and seemingly broken confidence, there's not many people who will be running to Price in order to sign him up for a role on the team, even as a back-up. While the upside in him is there and the pressure would be lesser on him in another market; there's always the idea that he will slump and slump hard during a stretch when you may need him the most. The unreliability of Price now and the possible pressure for him to prove people wrong could actually be his downfall in the end, as well. It has been quite the fall from grace for Price. From being the savior of the franchise to be the goat who is having his character questioned (of course, allegedly) by his own teammates. He's been outplayed by his partner and now there's a chance he could have a long road back to the hype that got him to where he is today. For a player with a lot of promise, you hope for the best for him and hope he doesn't become a part of the AGM tribe. Just when you think it's all over, something else pops up. To thank for that, we have CBC's Elliotte Friedman for revealing more issues in Tampa Bay than meets the eye. While the issues with OK Hockey have always been present, the fact the old owner doesn't want them; shows how much of an issue Tampa could become. We set the scene with Gary frantically on the phone, pacing in front of the TV of the living room, as Jim sits on the couch, bobbing and weaving trying to see the TV. Gary Bettman: But look, Mrs. Davidson, they won a championship under your husband's reign. Wouldn't you love to have that team back-- to remember the good times of his legacy?? Sure, Oren and Len kind of made a mess of it.....but....no, they aren't going to acquire Nathan Horton and have a "Seen Stamkos/Horton Hears A Who??" slogan-off. Jim Balsillie: Slogan-off?? I'm starving!! Gary, we have any beef slogan-off in the kitchen?? GB: (covering the phone) That's beef stroganoff and I said no before. (back to the phone) Mrs. Davidson, I'll make sure it's taken care of before the 15th. Trust me, have I ever swayed anyone wrong before?? GB: (avoiding eye-contact with Jim) I'll be back with you. Good bye. (hangs up, falls back onto the couch) MY GOD!! What was I thinking when I put those two guys in charge. You'd think with all those awful "Saw" movies and "Two and a Half Men" cash coming in, Koules would have the money to cover this team in everything they needed. JB: Well, you know Gary-- that deadline is close to Valentine's Day and I'd love nothing more than for you to buy me a hockey team. I'd love you forever. GB: Ick, that's the last thing I want. Don't worry-- we can make this work in Tampa. They have a Stanley Cup, we can't move a Stanley Cup winner. That'd just.....just be immoral and detrimental to the sport. We can't be a laughingstock in this landscape. JB: Well, can't be the laughingstock when no one is paying attention, that's for sure. But at what point did you think this would be a good idea to give it to these guys?? I mean, you look at what they had to offer and they were disjointed from the start. It was run worse than any fly-by-night pyramid scheme out there. GB: Funny enough, they were still better than you in terms of getting the team. In fact, I don't think you made an effort of it all-- right?? JB: Of course not, the Davidson's weren't on my radar. But, you look at the demographic and it's almost like this Phoenix mess. What happens if you own this team, too?? Why not just contract the teams and you'll get down to 28 teams, seven per division, then we bring back divisional playoffs-- as was always intended. GB: That's just silly, I put a stop to that because it's unnatural. Fact of the matter is that these two teams can be profitable if I can find the right ownership. At least Koules put something out there and tried, but went a bit over the top and really didn't have a grasp about how a team should be run. Hell, you could have run that team better. JB: Well, why not throw myself in the mix for this one?? This is something where I could just take a bad product, do some slight improvements, still not have the fans come out because it's a bit too hot.....then we move to my backyard and I can wake up to the practice everyday. We all win because not only do I get a team into Canada, but you'll get a stable franchise once all is said and done, as well as one less headache in the mix. GB: If you're going to make improvements, why not build a fan-base there and try to convince these people that this is their team?? You can grow the brand of the team by that. 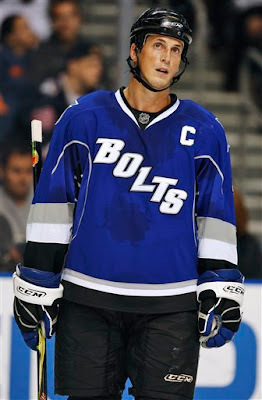 JB: Yes, because they really capitalized off the Stanley Cup and the "Seen Stamkos" campaign. Hell, the even brought back Barry Melrose to see if that'd garner some attention-- and it really didn't. Every gimmick didn't work as many would have thought and it's time for a change. You look at the other Florida team-- they're having issues as well, so why would it work for one team and not the other?? Sure, an interstate separates them, but at the same time-- it's virtually the same market demographic and it's probably not going to work in either. GB: Guh, I don't need to think about Miami right now unless we're going on vacation. But, they're a former Cup winner and do have a loyal fanbase-- it's not like they haven't succeeded on some gimmicks-- remember when they had the big crowds at the Thunderdome?? JB: Don't even get me started on that-- here's a team who has had issue with ownership from day one with Phil Esposito's group. It's a mismanaged group and probably won't get the correct owner for the gig and the publicity they need to thrive in a place like Tampa Bay. Tampa as a whole is really apathetic to sports-- look at when the Buccaneers won the Lombardi Trophy; hardly anyone came out!! They also didn't come out for the Rays when they went to the World Series!! What does that tell you about a city when they won't come out for their championship teams. I think the only reason they came out for the Stanley Cup is because of the cold conditions in the rink, mostly due to Tampa being too hot to be a real city. GB: I'll give you the point about mismanaged ownership and what-not, but they did come out and that's really what matters in the end for me. As long as people are coming out, they should be able to sustain something of a fan-base to keep the team going on and be loyal enough to fight your attempts to move this team to Chateau Balsillie. JB: Fine, we'll just have to agree to disagree. (looks at watch) Holy, we're late for dinner reservations. If we don't get there in time, we'll be limited to the salad and breaksticks we get with the meal. Grab my coat, I need to get my wallet. Judge Redfield T. Baum: (throws coats at Gary) T-BOMBED!!! JB: (walking to Gary on the ground) These running gags are fantastic, aren't they?? In this episode, we will look at a guy who; oddly enough, was able to play both major junior hockey and NCAA hockey in his career. That's something you couldn't do nowadays, but his time in college got him the buzz, but once he got to the pros, he was never able to stick with a team for a length of time. However, much like other AGMs, he's in the coaching realm after his career-- it's time for Steve Weeks. Weeks first started out on the scene in the 1974-75 season in the Ontario Midget leagues with the Markham squad before heading to the OMJHL with the Toronto Marlboros. Weeks only saw 18 games with the Marlies, with a 5.02 GAA. It didn't seem to be enough for the young Weeks, who made a move to the NCAA in the 1976-77 season with the Northern Michigan University Wildcats. It was a shaky year for Weeks, as he would go 7-7-0 in his 16 appearances for NMU. After he was more accustomed to the game, Weeks settled into his own for his sophomore season going 10-5-2 with a 3.31 GAA in 19 appearances. For his junior year, Weeks would start to get more appearances and take over the starter's helm with 25 games and went 13-8-2, enough to garner him CCHA second-team all-star honors and it set the stage for Weeks to make a big jump the next season. For the senior season of 1979-80, Weeks put the Northern Michigan team on his back, going 29-6-1 with a 2.95 GAA for the season. It didn't hurt that NMU had five players over 50 points, including one Bill Joyce who had 96 points in 40 games, as well as Atlanta Thrashers' GM Don Waddell who had 50 points in 37 games. The spirited effort helped the Wildcats to the NCAA Championship game, where they lost to the University of North Dakota. Weeks had such a year that he was named to the NCAA All-Tournament team for the Frozen Four, as well as CCHA first-team all-star squad for the year. It was a great starting point for his pro career with the New York Rangers, who had picked him in the 11th round of the 1978 Draft. Weeks would have to start the 1980-81 season with the New Haven Nighthawks in the AHL and played 36 games with them. It was a rough start, as Weeks went 14-17-3 in his rookie year and went 0-1-0 in his only appearance with the Rangers in that season. However, for the 1981-82 season, thanks to some crazy fate, Weeks was thrown into a starters role, as he made 49 appearances for the Rangers, in front of Eddie Mio, and Weeks did well for himself with a 23-16-9 record. It helped the Rangers get into the playoffs, but Weeks would only see four games (going 1-2-0), as Mio stepped up to take over the role for the playoff run. With Mio's big run, plus the acquisition of Glen Hanlon-- Weeks was splitting time between New York and the Tulsa Oilers of the CHL in the 1982-83 season. In the 19 games in Tulsa, Weeks sported and 8-10-0, but had a spiffy 9-5-3 record when called up by the Rangers for 18 games. While the 1983-84 season brought better NHL fortune with 26 games with the Rangers, Weeks only went 10-11-2, so he had to be sent back to Tulsa. In his three games, Weeks went a perfect 3-0-0. Before the start of the 1984-85 season, the Rangers traded Weeks to the Hartford Whalers for the ever popular future considerations. Weeks started off in Hartford, but got off to a mediocre 2-5-0 start and got him a trip to Binghamton to play in the AHL. While in Binghamton, Weeks went a perfect 5-0-0 with a 2.57 GAA. Weeks went back up to Hartford, finishing 7-7-2 for the rest of the season and 9-12-2 for the year. His play was good enough to get him in Canada's World Championship team, going 3-1-1 and getting a silver medal for it. The 1985-86 season saw Weeks up in Hartford backing up Mike Liut and getting 27 games of action, going 13-13-0 for the season. More of the same in the 1986-87, but with less games and a better record (12-8-2 in 25 games). The 1987-88 season saw Weeks play 18 games with Hartford going 6-7-2, which turned out to be an audition to be traded. At the trade deadline in 1988, Weeks was shipped to the Vancouver Canucks for Richard Brodeur. Weeks was able to get nine games end out the season with a 4-3-2 record. The 1988-89 season would see Weeks split some time with Kirk McLean on a subpar Canucks team. Weeks went 11-19-5 in his 35 games played. The struggles continued in the 1989-90 season for the Canucks and Weeks, who got less time with only 21 games and went 4-11-4 for the season. The 1990-91 season saw Troy Gamble push out Weeks to the IHL and the Milwaukee Admirals. With Milwaukee, Weeks went 16-19-0 for the year and 0-1-0 in his only appearance with the Canucks in November of 1990. The Canucks traded Weeks to the Buffalo Sabres for more future considerations, but Weeks never played in Buffalo. In the off-season, Weeks was able to catch on with the New York Islanders as a free agent for the 1991-92 and he would spent just a half-season with the Islanders before being a casualty to a logjam where former AGM Mark Fitzpatrick and Glenn Healy won out. With the Islanders, Weeks went 9-4-2, but was dealt to the Los Angeles Kings for a seventh round pick in the draft. Weeks would only spend seven games in LA, going 1-3-0. That summer, Weeks signed with the Washington Capitals, but never played a game, as he was left unprotected in the Expansion Draft and then was traded Ottawa Senators afterwords for future considerations. Weeks would spent a small time in Ottawa, going 0-5-0 in his seven games on the rosters and was sent down to a familiar place, New Haven, this time a member of the New Haven Senators. In New Haven, Weeks lost all six appearances-- which led Weeks to retire after that season. Weeks didn't stay long away from the rink, as he went back to Hartford to be the goaltending coach for the Whalers starting in the 1993-94 season. Weeks spent eight season with the Whalers/Carolina Hurricanes with various positions-- like goalie coach, assistant coach and scout. Weeks was signed up by the Atlanta Thrashers as a goalie coach in 2001 and still with them to this day. Weeks had plenty of ups and downs and was mostly a casualty of too many goalies being in the same place and Weeks not being able to deal with the pressure of it and faltering. He's moving along to the coaching side and seems to have good enough results to having longevity in the position that he's in, especially with one organization or another. 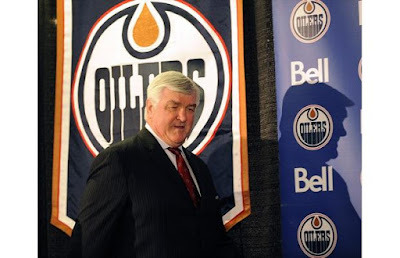 When TSN came out with a story coming out about how Pat Quinn is happy about coaching again, even though his Oilers are 0-for-2010; I won't lie-- I was a bit confused. Not so much to the point where I wonder why the story was done, you get the bug when it comes to any sport-- this is no different for coaching. I just wondered why they prominently display this article while Oilers are struggling so much. As of right now, the Oilers have not won a game in 2010, they have gotten points in only two games in their last ten (both overtime losses), they've only won one game in their last 18, and every bad bounce that could happen, often does. While only so much can be blamed on player and coach alike, the timing of it all could have been better-- like when the team has won at some point this year. And while the piece was just a fluff piece about how Quinn is happy to be working again, how he didn't think he'd be able to stay away from the game all that long; there's not that much to suggest he has that same killer instinct he once had. There's something about how it is written, focusing only on how he loves being at the rink and about his past performances, that could raise more eyebrows about what he's actually doing in the room and how he's actually coaching this team. Sure, the injuries to Ales Hemsky and Nikolai Khabibulin sullied a possible great performance for the Oilers, as a coach-- especially one who has won the Jack Adams Trophy for coach of the year twice-- you have to be able to get the most out of the guys on your roster now to fill in the void left by the key guys. Of course, you can also look at the GM position, with Jeff Tambellini, who hasn't been able to fill the void from the outside or inside in order to get this team onto a winning track again. Even if they are stop-gaps, the bleeding wouldn't be as immense and the team could actually win a few games and be in the playoff chase. The mini-camp this team held recently to get out of the funk didn't seem to go as planned, at least in the short term, which makes one ponder why is this team still having the trouble they are having; especially, with not one-- but two NHL caliber coaches, lest we forget that Tom Renney is on this coaching staff as well. The piece's casual vibes also had me wondering if Quinn really means what he says in terms of this being better than sitting around or if this is just going to be one last paycheck for him before no one else wants him. It almost comes off that way, with the examples saying he could be out on the golf course or with his grandkids; the amount of time that Quinn's mind is on this team, especially with the slump this team is in. When all is said and done, you can call this season a write-off for Quinn in terms of the injuries and lack of movement; but how much rope will he be given next season, enough to hang himself?? While many mentioned that the game past by the likes of Barry Melrose, you have to wonder the same for Quinn-- even though he had a steady job for a time before and after the lockout. Yet, with his style; it's could be almost time to put him out to pasture when this contract is up or even sooner if he can't change his own luck. Many months back, I talked about how I was hoping to do something in regards to the history of hockey when it came to Baltimore. And while I'm not one for doing research for things, this one had to be done in a type of research way since there's not much on the internet when it pertains to 19th century hockey. It took some toiling and some asking, but I found probably some very interesting information in regards to early hockey in the Baltimore area. Today, we'll start with the start of indoor hockey, the first artificial ice rink. I will say, Baltimore has never really been known for having the best rinks in the past. Anyone who has skated at Benfield Pines or Patterson Park rinks can attest to that. Yet-- somehow, someway, the early pioneers of the indoor skating concept got it right and it happened in Baltimore, no less. The rink was located, as far as I can tell, near where St. Mark's Evangelical Lutheran Church is between Charles and St. Paul Streets, along 20th Avenue in Baltimore. As far as I can tell, the exact location of the rink wasn't designated and it is now a vacant lot. 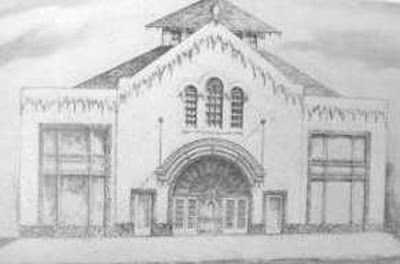 The exact dimensions of the rink were described thanks to an except from the Baltimore Sun from December 27th, 1894 a day after the North Avenue Rink (later known as the North Avenue Casino and Sports Centre) first opened. The building is of brick with a graystone front and iron roof, and is 75 feet by 300 feet. The skating surface is 55 feet by 250 feet on a foundation resting solidly on the ground. Seven consecutive floors were laid with interlinings of waterproof paper and wool. On this foundation is build a seamless pan, which contains the artificially frozen ice for skating. Over three and one-half miles of one and one-half inch pipe are laid throughout the pan. This is covered by four inches of water, which is frozen solid to 100 tons of ice in 37 hours. Saying it in an old-timey voice makes it even radder. Now, for such a task to happen, you'd need a nuclear winter in most cases for that kind of speed in that day in age. However, someone, somewhere in Baltimore thought of a refrigeration system to which they probably rejoiced by throwing their index-finger in the air going "EUREKA!!" before stroking their beard in a old-timey way. Here comes the science. The refrigerating system is by means of compressed liquefied ammonia allowed to expand in the pipes running through a brine tank. A zero cold results. The cold brine is then pumped through the pipe in the rink tank by the force of a 60-ton engine. The water is thus frozen into a solid mass of clear ice. So simple, yet so complex at the same time. While many folks back in the day only know of the outdoor skating, the indoor facility provided a nice comfort from the weather that came with skating outdoors. The North Avenue Rink make sure to cover that bit of annoyance thusly. Around the skating surface is a promenade floor about two feet higher and separated from the rink by a solid partition. Gas stoves warm this part of the building in order to keep comfortable the spectators, who are provided with seats. There you go, the first skating rink around happened and it was in Baltimore of all places. The rink opening saw the Johns Hopkins University team take on the Baltimore Athletic Club team, playing to a 2-2 draw after their two-30 minute halves, which is another post for another time in the near future. After the game, the people in attendance were allowed out on the ice to test it out for themselves. The game brought out many interest onlookers from the Baltimore area, as well as some from as far north as New York. It was a marvel for it's time, which is now in most every town around North America and overseas. Yet, it's odd how the times have changed where many are calling for more outdoor games, while back then-- many were calling for an indoor game every once and a while. And to think, the lore that the refrigeration unit was moved to the present-day First Mariner Arena. I would like to thank Mr. Geoff Zonder, archivist of Yale University for pushing me in the right direction for getting this information, as well as the information in the upcoming post on the subject matter. Eric Staal was named the Carolina Hurricanes captain today. My question is why now--- why not two years ago?? While Rod Brind'Amour should be commended for his years of service in the NHL and the lore behind him, in this day-in-age, it's almost a lead by example kind of role. This is why you saw young guns like Mike Richards and Jonathan Toews being named captain early on because they are character players. Yet, you have to wonder how many times the captaincy change is long overdue. The Southeast Division alone has had two captaincy changes that have seemingly been long overdue. The Staal situation this time and a few weeks back Chris Clark getting traded from Washington, thus giving the captaincy to Alex Ovechkin-- with Clark being the stop-gap of captains so that Ovechkin got more comfortable with the language and leadership role. Both you could almost see happening at anytime, with some saying (especially in the Caps situation), the team already belonged to the next in line and it was a matter of time. At least in the Caps case, they traded him away. You have to wonder what will happen in the Canes locker room with Brind'Amour still being there-- maybe peering over at Staal and putting him under a microscope at every turn. While Brind'Amour may have had veto power and not used it, you can still bet there's something stewing deep inside him that's not sitting right. While a stop-gap is alright, it almost seems like a slight to the guy you name captain. In Clark's case, everyone knew that it was Ovechkin's team; but why did they have to put the "C" on him?? It could have been due the youth of the team needing some kind of figurehead and Clark was the most experienced one there. What makes it interesting is the cases of the Montreal Canadiens and Toronto Maple Leafs of this season, where they have no captain. They have guys who could be put into that role, but yet-- nothing has come from it. Does that speak to the lack of leadership the vets on that team have or that they don't want one guy to stand out on a team full of leaders?? Obvious, the examples could be fit to the teams very easily if you think about it. How do you know if a captain has worn out his welcome and when does it start becoming a distraction?? Most of the times, the captain get striped of his "C" due to fights with management, like Alexei Yashin in Ottawa, just being replaced by new blood like Mike Modano in Dallas, or the coach calling a player out like in Patrick Marleau's case this past summer in San Jose. Other than that-- it's almost due to the captain leaving to free agency, retirement, or in a somewhat rare case-- trade, where a captain loses his "C" from a team he was on. At least in Marleau's case, it woke him up for the regular season, but the true test for him will be in the playoffs. As far as wearing out a welcome, how much of a shot in the arm is it for the team, especially knowing they let their leader down. If the captain isn't safe from being targeted, you can only imagine how the players feel when it comes to whether or not they will be next to be called out, demoted, or even sent off the team. Conversely to letting your captain down, what if the captain let the team down?? The fact of the matter is that Brind'Amour's play has been subpar at best in the past few seasons and really shouldn't have be a surprise that he could be wearing down physically. This is obviously a move that was in the making, but you would have only hoped that Brind'Amour would have been the one to announce he was stepping down as captain, rather than having the Canes management go up and almost run him down, so to speak, when it comes to stripping him of the captaincy. By the way, the longest serving captain to date is Daniel Alfredsson since the 1999-2000 season. While it's good for teams to actually excel their young stars into the leadership role, there's much better ways to do it than to trade away or strip your current captain of their role. Especially to do it mid-season, it has the ability to shake-up a teams psyche for the better or worse-- which is a delicate balance. Luckily, for the recent changes-- the Caps seemed to know the change was going to happen and were over it pretty quickly, while the Canes season couldn't get much worse. Even so, it may set a bad precedent for possible changes down the line. I've mulled this one over for a while, but thanks to Marc "with a 'C'" getting his new dome between the pipes, I decided to to ahead with it. There's a lot of quirks with this goalie, from his giant Great Gazoo Jofa helmet, all the way to his backside up against the middle bar when play was in the other end, then to no tape on the blade of his stick-- the goalie will be remembered for a while; even if his NHL career lasted five seasons. He overcame longshot to make a name for himself, as well as staying alive after a condition that could have ended his career before it started. This week's AGM: Tommy Soderstrom. Soderstrom's career didn't get off the the greatest of starts. Playing in Sweden, Soderstrom was able to catch on with the Djurgardens IF Stockholm squad. Yet, even though he was the property of the team, Soderstrom was relegated to playing a small role on the junior squad of the team. He wouldn't see much time while playing in the Swedish junior leagues, and even though he was able to get part of the Sweden's silver medal in the 1989 World Juniors, he was becoming frustrated with hockey in general. However, during the 1989-90 season, Soderstrom got a mini-call-up by the Sweden's second league team, IK Viking Hagfors and went 3-0-0, only giving up three goals in those games-- including one shutout. It was good enough for Soderstrom to get work in the Swedish Elite League with Djurgardens in the 1990-91 season. In the 39 games for Djurgardens, Soderstrom went 22-12-6 with three shutouts and was able to get Rookie of the Year honors from the Swedish league. Also, Djurgardens, on the back of Soderstrom, were able to capture another Swedish league title. The next season, another 39 games for Soderstrom, this time going 15-8-11 with four shutouts. Also in those two seasons, Soderstrom played for Sweden in the World Championships, winning Gold Medals in both of 1991 and 1992; winning the top goaltender award in 1992. With all the buzz around Soderstrom, he got plenty of attention when it came to the NHL. Luckily for the Philadelphia Flyers, they had his rights after they drafted him in the 11th round of the 1990 Entry Draft. The Flyers then decided to bring him over in order to fill the void left by Ron Hextall. Soderstrom started off in the AHL onces coming to North America to play with the Hershey Bears. Soderstrom has a solid display in his seven games in Hershey, going 4-1-0; which was enough to warrant a call-up. Thankfully, the competition of Dominic Roussel and Stephane Beauregard for the 1992-93 season wasn't much match for Soderstrom who took over the starting role immediately. In the 44 games that year, Soderstrom went 20-17-6, which wasn't too bad for his first year in a new country. Yet, it could have all came to a quick end. Soderstrom had Wolff-Parkinson-White syndrome, which is a blockage of electrical pulses to the heart. With the pace of a game in the NHL, Soderstrom was in and out of the hospital to deal with procedures when it came to WPW. He had to undergo surgeries in the tail end of the 1992-93 season and to start of the 1993-94 season to fix his issues. It didn't put him at a long-term injury and brings up thoughts of a current day Swedish goalie, Jonas Gustavsson, when these things come about. With WPW having a very quick sudden-death rate, Soderstrom is a lucky one in all of this. However, with the 1993-94 season, it could have been the harshness of the surgeries or beginners luck; but Soderstrom started to play very weak. Playing with the Flyers, Soderstrom didn't fair well enough in his 34 games going 6-18-4 during that time, and then with time in the AHL with Hershey, going 3-4-1 in his nine games down there. With the inconsistency all around, Soderstrom wasn't as sought after as before, thus made expendable. Before the 1994 lockout, the Flyers traded Soderstrom to the New York Islanders for Ron Hextall and a sixth-round pick in the 1995 Draft. After the lockout, Soderstrom started on a bad Islanders team and went through the motions with the team in his 26 games he played, splitting with Jamie McLennan going 8-12-3 with a solid .902 save percentage and respectable 3.11 GAA. In the 1995-96 season, the logjam on the Long Island started, as well as the fisherman era jerseys. Soderstrom was the starter, but would see young goalies like McLennan, Tommy Salo, and another AGMer Eric Fichaud getting chances to filling for Soderstrom's spot. Soderstrom still got 51 games in, but went an abysmal 11-22-6 with a 3.87 GAA and .878 save percentage. 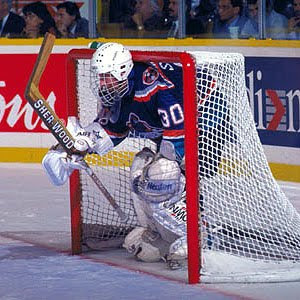 Yet, with the influx of the young goalies, Soderstrom was relegated to the minors for the 1996-97 season with the Utah Grizzlies of the IHL. Soderstrom only played 26 games behind Mark McArthur in Utah and went 12-11-0, which got him a brief call up to Rochester Americans of the AHL for two games, going 2-0-0. Soderstrom got one non-decision game in with the Islanders in October playing 10 seconds, but that was it for the NHL career. After then, Soderstrom would return to Sweden to play with Djurgardens again starting in 1997-98, with a great return. That season, Soderstrom had the best GAA in the Swedish Elite League (2.24), had the best save percentage (.916), was the league MVP, and got Djurgardens to the finals, but lost. The 1998-99 season wasn't so kind, with his GAA still being decent at 2.75, his save percentage was down to .897. Soderstrom saw a limited role in 1999-2000 as a back-up, to Mikael Tellqvist, but was able to leave on top with Djurgardens winning another Swedish Elite League title. After that, Soderstrom would retire. Through it all, he was able to make a big buzz for himself and then overcame many healthy issues to get to the peak of the hockey mountain. While it was short-lived, Soderstrom's look will be very memorable for many. He made his name in Sweden and seemed to have kept his great play there, as well. At least he never forgot his roots when he retired and helped his team to another championship into retirement. Patric Hornqvist is having a heck of a season for the Nashville Predators, leading the team in goals and tied for second on the team in points. Personally, he'd be my candidate for the Calder Trophy as Rookie of the Year.....if he were eligible. 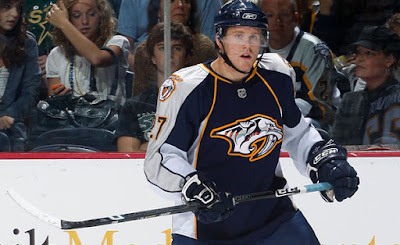 However, since Hornqvist played 28 games last season for the Preds, the Swede is no longer eligible to win the honor. To be eligible for the award, a player cannot have played more than 25 games in any single preceding season nor in six or more games in each of any two preceding seasons in any major professional league. The player must not be older than 26 years before September 15 of the season in which he is eligible. Thus, with Hornqvist playing three more games than the limit last season, he'll get hosed out of the award for this year; which would be a very dark horse pick considering the lack of attention he has gotten. Hornqvist has 19 goals, six power-play goals, six game-winners, and is a +12 on the season. He's a sound player and will probably shine for years to come with the Predators. A thing like this will make some wonder if the NHL needs to adjust the rules with it comes to games played for all of this-- especially if Hornqvist builds off of this to have a fantastic season, as well as having more points than the actual first-year guys. I know that rules are rules, but to be deemed ineligible by three games seems a bit silly to me. Especially in a time where call-ups are the norm with all the injuries going on in the sport this day in age. If the NHL were to bump it up to 35, even 40 games in a season or 15 games in each of the last two seasons, that'd be something I could get behind and would see it a little more competitive in a situation like this. This is a something that could have saved Jason Spezza, who played 33 games in 2002-03; thus making his solid 55 point campaign in 2003-04 null and void for the Calder race. Though he would have lost, odds are he could have been in the race and maybe even more motivated to push for himself and his team. Yet, thanks to the Sean-O Rookie Theorem, he's always eligible. It's just a shame that a guy like Hornqvist has a legitimate shot at being the ROTY gets screwed because of only three games. He seems to be a great story for Nashville and could have given them more attention for the future, but alas; semantics rears it's ugly head. My hope (and it's not just because I picked him up on my fantasy team) is that Hornqvist keeps pushing like he has been and draws the attention of people and makes them wonder why he isn't considered for the Calder Trophy this year. With the official announcement made yesterday, Curtis Joseph has retired from the NHL, thus another NHL '94 alumnus bites the dust and leaves us with 45 players left from the game. Joseph leaves the game with the fourth most wins by any goalie at 454 in 19 seasons of work. Of course, he also collected 352 losses, which ties Gump Worsley with the most losses in the NHL career of a goalie, but that's neither here nor there. Joseph had a great career with six teams, three of them being in Canada-- but his most memorable times were with Toronto and Edmonton, where he is/was hailed as a folk hero for his service. Toronto especially, where he was a finalist for the Vezina twice, the Lester B. Pearson award once, and won the King Clancy Memorial Trophy for contributions in the community on and off the ice. His play was a big reason why the Leafs got to the Conference Finals in 1999 and 2002 and finished up his career there, even if it was a back-up to Vesa Toskala. Joseph is also the first goalie to win playoff games with five different teams (St. Louis, Edmonton, Toronto, Detroit, and Calgary). With all of this, you have to wonder how he was ever undrafted to start off with. Joseph is a three-time all-star, a gold medal winner in 2002, and he probably ate the bowl, too. Of course, now, the focus turns to the Hall of Fame, which makes you wonder why there's any kind of discussion with all of this?? His numbers and play alone should make him a Hall of Famer, even if it isn't first ballot. Sure, Joseph doesn't have a Stanley Cup ring to his name, but is that the end-all be-all for someone who is on the fringe?? Albeit, he's the only goalie in the top-10 in all-time wins to not win a Cup, but all the same; the numbers should be something that should supersede the lack of the Cup ring. Not only that, but the effect Joseph had on the places he played need to be placed into the balloting of Joseph. He made the people of Edmonton and Toronto come alive and have hope, especially in the playoffs where CuJo built his legendary status. Even while his last years, post-lockout, were very forgettable; that shouldn't take away from what he achieved beforehand. However, the lack of Cup ring could keep him out. If that's the case, you have to wonder how Mats Sundin will get in. Of course, that brings up another question of who meant more to the Leafs organization during that time, Joseph or Sundin-- but that's another topic for another time. Back to the lack of ring, the thing with Joseph has that guys like, let's say Dino Ciccarelli, don't have is the off-ice work he has done, not only in the community with CuJo's Kids, but reaching out with Right to Play and heading over to do work in places like Rwanda. Yet, with guys with rings like Doug Gilmour waiting on the outside of the Halls, odds are Joseph will be passed over for the time being. It doesn't seem to effect Joseph, because he seemed like a happy-go-lucky guy in his career, even if he did take out a ref during the 2000 Playoffs. He came up from being born of teenage parents, being adopted by a different family of a mixed-race family, then going undrafted and fighting his way to get to the point where he was. He didn't seem too sad to retire, but odds are he's going to get into the coaching game sooner rather than later. Plus, he leaves a mark on having some of the best masks out there. For a guy who almost ruined his career by not reporting to the NHL in order to be with his family for Christmas in his AHL city, this week's AGM made quite the career for himself after the fact. Though, once he had a stellar first few years, he started to struggle as his career went on. Even with that, he made a nice career post-retirement for himself. Folks, it's Pete Peeters. While Peeters got his start with the Edmonton Crusaders of the AJHL Junior "A" league, he was good enough in his year with the Crusaders to get a spot on the Medicine Hat Tigers of the WCJHL (now the WHL) for the 1975-76 campaign, where he split duties with Ken Holland. Peeters first year was somewhat decent going 16-11-9 for the season. With Holland's departure, Peeters got the starting role in Medicine Hat with 62 games and a 26-24-12 record, though his GAA of 4.07 and save percentage of .877 left something to be desired. However, the Philadelphia Flyers saw something in Peeters, whom they selected in the 9th round of the 1977 Amateur Draft. It didn't take long for Peeters to make a big jump from Juniors to the Pros, as the 1977-78 season marked his first pro season, splitting time between the IHL's Milwaukee Admirals and AHL's Maine Mariners. In Milwaukee, Peeters played in 33 games going 12-10-7, while in Maine he went 8-2-2 in 17 games there. When he got to Maine, Peeters put up a 2.80 GAA in those 17 games and made the Flyers look like geniuses for their late-round pick. During the 1978-79 season, Peeters continued to shine in Maine, going 25-6-3 in 35 games with a 2.90 GAA for the season. Yet, in the middle of the 1978-79 season, the Flyers called up Peeters to see what he was really made of. However, Peeters at first refused to go up. It was Christmas time and Peeters had plans to be with his wife and parents in Maine. After much debate and some heated conversations-- Peeters went to Philly to play in five games there. His time in Philly for that year was less than stellar, going 1-2-1 with a 3.43 GAA in his tenure there. It was a learning experience and would help carry him in his future with the Flyers and in the league. The 1979-80 season saw Peeters get into a decent sized role with the Flyers, splitting with Phil Myre in the net. The combo of Peeters and Myre were so good, the Flyers set a NHL record for going 35 games without being beaten, although they did have 10 ties in that span. Peeters went 29-5-5 in his 40 games played and got the call in most the starts in the Flyers playoff run, as he went 8-5 in the 1980 playoffs, helping the Flyers get to the Stanley Cup Final, but lost to the New York Islanders in six games. During the 1980-81 season, Peeters saw a little confidence sent his way by management, as the team sent Myre to the Colorado Rockies, but sent the mixed signal by splitting Peeters' duties with Rick St. Croix. Peeters got 40 games with the Flyers, going 22-12-5 with a 2.96 GAA for the year. However, Peeters breaking point came with the 1981-82 season, when the Flyers started to rotate three goalies with Peeters getting a majority of the starts, St. Croix behind him and newcomer Pelle Lindbergh making his presence known in Philadelphia. Peeters got 40 games in with a 23-18-3 record and a below average 3.71 GAA. In June of 1982, Peeters was on the move to a better spot for himself, with the Flyers trading Peeters to Boston for Brad McCrimmon. Peeters would take over as the starter for the Bruins and lavish in the experience. 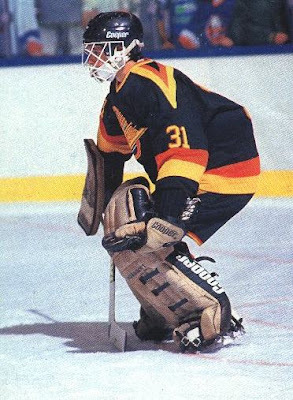 The 1982-83 season saw the breakout of Peeters, as he played an amazing 62 games while putting up a 40-11-9 record with a 2.38 GAA and .904 save percentage. That season was good enough to get Peeters the Vezina Trophy nod for the '82-'83 season. He was the first Bruins goalie since Frank Brimsek, who won it in the 1941-42 season. The 1983-84 season was a rough one for Peeters, who suffered a concussion in November and then whiplash in March. Even with that, Peeters got 50 games in with a 29-16-2 record with a 3.16 GAA. That same season, Peeters was ejected in a game against Hartford in March of '84. Oddly enough, Peeters was the back-up goalie at the time and ejected while on the bench. It would not get any better in the 1984-85 season, as Peeters was injured while with Team Canada in playing during the Canada Cup with a sprained ankle. Also, Peeters would deal with hand injuries and neurological injuries as well, to the point where he needed a CAT scan for his dizzy spells. Even with all of that, Peeters played 51 games, but had his worse season yet, going 19-26-4 with a 3.47 GAA. Peeters will be known as the goalie that allowed Mario Lemieux's first goal in the NHL in October of 1984. The Bruins started off with Peeters in net for the 1985-86 for eight games (3-4-1, 3.84 GAA) before they though it'd be better to go in a different direction. 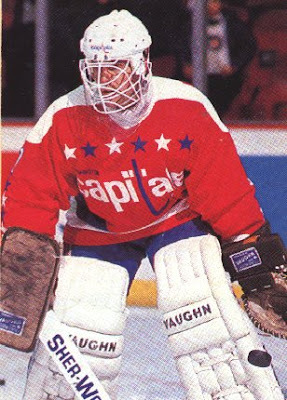 Peeters was traded to the Washington Capitals in November of 1985 for Pat Riggin. Peeters would be back into split time in the 1985-86 season, this time with Al Jensen. Peeters would get 34 games in that season, going 19-11-3, revitalizing his slumping year a season prior. The 1986-87 season saw Peeters have some injury woes with a pulled stomach muscle in the middle of the season, but also splitting more time in the Caps net, this time with Bob Mason, after Jensen was traded to Los Angeles. Peeters saw 37 games with a 17-11-4 record, as well as four games in the AHL with the Binghamton Whalers with a solid 3-0-1 record and 0.98 GAA in that time. For the 1987-88 season, it looked like Peeters was going to take off, but due to a strained knee-ligament, it held him back a bit; which allowed Clint Malarchuk to bypass him. Peeters played 35 games, with a 14-12-5 record and decent 2.78 GAA. The 1988-89 season saw a lot of twist and turns in net, with Clint Malarchuk being shipped off to Buffalo and the Caps bringing in Don Beaupre, but Peeters still got consistent starts, with 35 games to his credit. Peeters would go 20-7-3 with a 2.85 GAA; but with Beaupre's entrance, it made Peeters' disposal and not re-signed. It allowed Peeters to re-sign with the Philadelphia Flyers in June, but for a five day span in late September and early October, there was a lot of shuffling around. The Flyers sent Peeters and Keith Acton to Winnipeg on September 29th for future considerations, but on October 3rd; Peeters and Acton were traded BACK to Philadelphia for a pick in the 1991 draft. So, Peeters was back in Philly again. Peeters had been resigned to his role as a back-up goalie behind Ken Wregget for the 1989-90 season. Peeters went through a dismal year, playing in 24 games, but only winning one. That's right, Peeters went 1-13-5 for the year, but had a 3.74 GAA-- not what you'd expect for a one-win goalie. Peeters started the 1990-91 season in Hershey with the Bears in the AHL playing two games and going 0-1-0 before being called up by the Flyers to be the third-wheel again for the Flyers, behind Wregget and Ron Hextall. Peeters would put in 26 games, posting a 9-7-1 record and 2.88 GAA. Peeters would call it quits after that season, moving onto coaching instead. Peeters would catch on with the Winnipeg Jets for the 1994-95 season as a goalie coach, but only lasted a season. Then, from 2002-03 until the 2008-09 season, Peeters went to work with the Edmonton Oilers as their goalie coach. After being let go by the Oilers, Peeters got the same job with the Anaheim Ducks. There were a lot of tough times for Peeters, mostly being squeezed out due to some kind of happenstance. Yet, he has plenty of personal accolades to look at and some decent stats throughout his career; but once his injuries started to get to him, it seemed like he could never truly recover into his form he had early in his career. We'll see what he can do as a coach, because you can only do so much as a coach when it comes to teaching others about how you got successful. On Friday, Rick DiPietro made his first start in almost an entire calendar year, in a losing effort against the Dallas Stars. 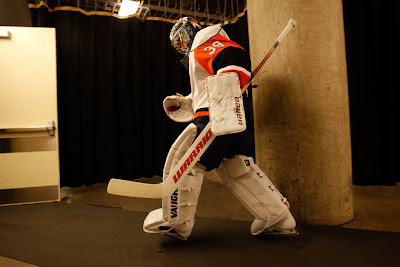 For most of the Islanders fateful, the return of DiPietro is a hope that he will remained uninjured for the duration of the season and for the duration of the remaining 12 years in his record 15 year deal. For the others, it's just fodder to wonder when the next time DiPietro will go down to injury and for how long he will be out. If nothing else, it will get people buzzing about DiPietro and the Islanders. Yet, you wonder why there's such an uproar against DiPietro and why there is so many who are against DiPietro. While we were talking about DiPietro a few weeks ago, it seemed that consensus was that he came off a little too egotistical and really hadn't done much to earn the stripes he has gotten. Greg Wyshynski said he was a guy who was born on third base and thought he hit a triple, which is pretty much the vibe he gives off with his swagger he puts out there. I've never met the guy, so I'm not really one to talk, but he seems like the kind of guy who could be a little over-the-top into himself. Even with all of that, you have to be rooting for him to actually get better. While there are many who like to bring up the disappointment other top picks like Alexandre Daigle and Jason Bonsignore have brought about and the fodder that comes along with the flops they became, there's a little part of me (at least) who hopes that not all of the hyped top picks will falter and fail. Yet, the cynical part of me wants to, just to have some kind of jokes to bring to the forefront. With DiPietro, there's some people who may hold something against him; especially when the Islanders chose him over Roberto Luongo when it came to who the goalie of the future would become. Of course, who's to say that Luongo would be the goalie he is if he stayed in the Islanders system or if he would have been overworked and them faltered because of the lack of support he would have gotten. Yet, hindsight being what it is-- Luongo is an all-world goalie while DiPietro is the hospital-ward goalie. See, cynicism. Even with DiPietro coming back, the Islanders were doing pretty well with Dwayne Roloson in net. Is there going to be a point where Roloson will be be deemed the #1 goalie over DiPietro, even if DiPietro is the franchise goalie?? If DiPietro continues to start and continues to struggle, there's a point where you have to do what's best for the team and put Roloson back in the net, but will there be a move like that in time or will it be too little, too late?? Of course, there's a chance they'll platoon and as they get closer to the end of the season; then the real starter will emerge to give the best chance to the Islanders. Whatever may happen, DiPietro coming back is the first step in his recovery to repair his first-overall pick status and to warrant his 15-year deal with the team in order to keep him with the team forever. I'm sure that's something Charles Wang is thinking, especially since he wanted this to be a steal of the century and it's turning into the dud of the decade. Still, if nothing else-- the fodder DiPietro's injuries have created will give many a lot of material every time he steps out onto the ice. While the buzz about Jordan Eberle and his clutch performance during the World Juniors is well-deserved, the fear that some may have is whether or not Eberle's performance in junior could be left there when he finally does decides to turn pro. It seems to be habit of those who have been drafted by the Oilers in the past, where the performance and hype that they created before getting onto the Oilers is often left where they came from. Just looking up and down the past hopes of the Oilers who had a lot of buzz around them, they have never really seemed to pan out as the Oilers fans and organization had hoped. The likes of Rob Schremp, Jani Rita, Jesse Niinimaki, Marc-Antoine Pouliot, all the way back to Tyler Wright and Jason Bonsignore-- they all had promise in terms of turning the team around, but never really panned out to be the savior many had thought they would become. Even when looking at the past-- there hasn't been many first round superstars for the Oilers. Only Ryan Smyth and Ales Hemsky could be consider successful first round picks in the past 15 years for the Oilers. While Eberle's numbers are fantastic this season with the Regina Pats of the WHL (29 goals, 31 assists in 28 games), who's to say it'll translate to the pro game. Especially since Eberle really hasn't been the big time scorer in the past, it could be just a big build-up to a let-down when he converts to the professional game, even though he held his own in the AHL for the nine games he was down there at the end of 2008-09 season (3 goals, 6 assists). Even with that, it seems like he's going the Rob Schremp route with the Oilers, a somewhat menial junior player, exploding into a star in juniors after he was drafted, but not good enough to make the big club. The true test is next season, to see if Eberle can make the roster or put back as an overager in Junior to see if it's exactly like Schremp. The bigger question is whether or not the Oilers' management is doing or has done a good job when it comes to their prospects. You wonder if through the years if there are some guys who should have been held back, but had a good year and were brought along too quickly. Conversely, if there's a time where a player had been held back when they should have been brought up to the next level; but since they were held back, it shot their confidence down and made them tank the way they did. There's plenty of questions when it comes to handling that have to be thrown into the equation. But the pressure may now be on for Eberle to perform as clutch-esque in Edmonton as he did in the past two World Junior Championship. How much will be put in his shoulders when he actually get up to the pros and how much time with the fans give him before they start to give up hope and want him traded away to get something better?? Yet another question is whether or not the Oilers will bring Eberle right up or let him settle in the AHL for a while to make sure he's the real deal, even if he is good enough to be on the third line in Edmonton?? How the Oilers treat Eberle and how Eberle responds to the treatment will be the big litmus test to see if he will be a solid professional or lose his confidence and be yet another "What could have been/Where did he go" story for the Oilers draft history. If you remember last week, I talked about me and my boy J-Rock doing our picks for the Canadian team. We also did the USA team in whole and part of Russians team. Oddly enough, we did better in the USA team. Oddly enough, J and I realized that we couldn't come up with many Americans who would be worthy of a spot....and it looks like were were kind of right. Going 18 for 23 (78%) isn't too bad, but going all out for the defense was pretty sweet. However, I'm surprised that Quick got the call over Anderson. Sure, it's really for the third goalie slot who may not play throughout the whole tournament; but still. Shocking how Anderson's quick rise really wasn't enough to counter Quick's rapid rise. It is what it is-- neither will play with Ron Wilson saying he'll probably ride one goalie the whole way. The forwards were a crap shoot. I'm very surprised a guy like Gionta, who has a lot of scoring power, was overlooked. Knuble is a mucker and grind guy, but seems like Callahan is a bit more of a younger Knuble and will be in the system longer than Knuble would; which makes sense in terms of grooming him for the organization. Ryan hasn't had the best start to a year after a great rookie season, but Burke always seems to be high on him; since picking him second overall in the 2005 Draft. I guess the Backes thing is for the 13th position and can fit in anywhere. Pavelski is a under-the-radar pick that could definitely help for secondary scoring. While we never got done the Russians, we did fairly well for guys biding our time stocking shelves. We just need a team to pick us up and make us part of management, and we're golden. Since it's the time of year for the World Junior Championships, I should probably key in on someone who has been there before and won two championships with his country-- one as a back-up and one as a starter. And while his international success was not to bad, his subpar play when he was in the professional ranks is what people will remember him most for. At least he has some of the most rememberable pad sets of all time. Look kids, it's Trevor Kidd. Thanks to his play with the Eastman Selects in Manitoba Midgets, Kidd was able to catch on solidly with the Brandon Wheat Kings of the WHL. Kidd was able to get some decent time as a back-up with the Wheaties, behind Kelly Hitchins, seeing 31 games. Kidd had an 11-13-1 record, which wasn't good enough to help the Wheat Kings into the playoffs. The 1989-90 season would see Kidd go right into the starter's role; getting 61 games and going 24-32-2. While he was able to get the Del Wilson Trophy for top goaltender in the WHL, he still couldn't help the Wheat Kings into the playoffs. Personal success came when Kidd was named to the World Junior team, but played back-up to Stephane Fiset, but got a gold medal out of it. His impressive season did get him plenty of buzz amongst scouts; which made Kidd the 11th overall pick in the first round of the 1990 Draft, as selected by the Calgary Flames. Kidd went ahead of Martin Brodeur (20th overall), which is a decision the Flames probably hate in hindsight. The move wouldn't have been if the Flames didn't trade with the Devils. That's right the Flames and Devils swapped first and second round picks the day of the Draft because the Flames wanted Kidd and knew the Devils would have pick him up ahead of them. The rest, they say, is history. The 1990-91 season would finally give Kidd the success he had worked hard to get. While he started out in Brandon with a 10-19-1 record for the beginning of the season, Kidd was shipped out to the Spokane Chiefs, who would eventually be the WHL Champions and the representative of the WHL for the Memorial Cup. Kidd would take over the starting gig from Scott Bailey and went 8-3-0 in his 14 regular season games, with an astonishing 14-1 record in the playoffs. Kidd also won all three games in the Memorial Cup to close out a fantastic season for himself. That season included another trip to the World Juniors, where he started six of the seven games, capturing a second gold medal for himself. The 1991-92 season had Kidd going here, there, and everywhere in between, with the Flames loaning out Kidd to the Canadian National Team. 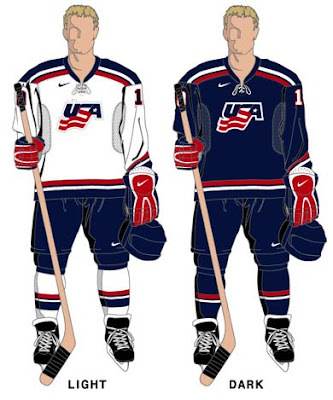 You see, back in the day of no NHLers in the Olympics, teams would loan out their prospects or lower-tier players to play for the National team, who would play in exhibitions throughout the world to get ready for the Olympic competitions. Kidd got a good amount of net time with the National team, playing 28 games and going a solid 18-4-4 in this tenure. Kidd would also be loaned out this third straight World Juniors team, but due to the turnaround of talent, the Canadians would finish sixth in that tournament. Kidd would only see one game in the Olympic Games in Albertville, France; which was a 10-0 destruction of Norway, but it was enough to get him a silver medal for his troubles. The 1991-92 season also saw Kidd get his first taste of NHL action, playing in two games late in 1992, going 1-1-0 with a 4.00 GAA in his two games. The 1992-93 season had Kidd back in the learning process, playing with the Flames' IHL affiliate Salt Lake Golden Eagles for the season. Kidd fared okay in his first 30 games of professional action going 10-16-1 before falling to a leg injury in February which ended his season. To start the 1993-94 season, Kidd was up with the big club in Calgary, backing up Mike Vernon and held his own in his 31 appearances, putting up a 13-7-6 record and a 3.16 GAA. When Vernon departed after the season, it was Kidd's ship to steer, as he led the league with 43 starts in the lockout-shortened season of 1994-95 and put up an impressive 22-14-6 record with a 2.61 GAA and finished 7th in the Vezina Trophy balloting for the year. The playoff success wasn't too kind, however, as the Flames went out in the first round to the upstart San Jose Sharks in seven games. The 1995-96 season had Kidd sharing duties with Rick Tabaracci, but Kidd got a majority of the games. Yet, at the same time, he was the one with the worse record at 15-21-8 and a 2.75 GAA for the year, but only saw two games of playoff time, with the Flames bowing out in four games to Chicago. Kidd would regain his starter's role, this time over Tabaracci (who was dealt to Tampa early in the season) and Dwayne Roloson. Kidd's early season success to get Tabaracci moved wouldn't hold on as Kidd finished the year 21-23-6 with a decent 2.84 GAA and .900 save percentage. A lot would change before the 1997-98 season, as Kidd and Gary Roberts were dealt from the Flames to the newly moved Carolina Hurricanes for Andrew Cassels and prospect Jean-Sebastien Giguere. Kidd would take the starter's role in a platoon of goalies, which included Sean Burke, Kirk McLean, Mike Fountain, and former AGM inductee, Pat Jablonski. Kidd played in 44 games, mostly due to missing seven games to a groin injury and seven games to a broken finger. Kidd went 21-21-3 with a great 2.17 GAA and .922 save percentage. The 1998-99 season wouldn't be so kind to Kidd. 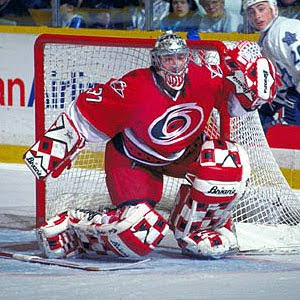 The Hurricanes had picked up Arturs Irbe from the Vancouver Canucks in the off-season, which gave him the starting role and didn't allow Kidd the time to get into the net as much. Kidd only got 25 games in the season, going 7-10-6, but still had a good GAA (2.86) and save percentage (.905). It was not enough, though. Kidd was left unprotected for the Expansion Draft, for which he got picked up by the Atlanta Thrashers. However, his stay was non-existent as the Florida Panthers trade for Kidd in exchange for Gord Murphy, Daniel Tjarnqvist, Herbert Vasiljevs, and a sixth-round pick. Kidd made his presence felt in Florida quickly, going 14-4-2 in his first 21 games of the 1999-2000 season, but due to a freak accident in the Panthers' skills competition, Kidd was sidelined with a dislocated shoulder. He lost his only game in the AHL with the Louisville Panthers and then lost his next seven games back in Florida, putting him at 14-11-2 for the season, but better numbers with a 2.63 GAA and .915 save percentage. It was something Kidd could never recover from, especially after the Panthers picked up Roberto Luongo from the Islanders. The 2000-01 season saw Kidd and Luongo do battle for time, but Kidd's 10-23-6 record and dismal 3.31 GAA and .893 save percentage gave the nod to Luongo for the 2001-02 season. It was worse news that season as Kidd went 4-16-5 with a 3.21 GAA and .895 save percentage. With Luongo being the franchise of the Panthers, Kidd wasn't re-signed. In August of 2002, Kidd would catch on as a free agent with the Toronto Maple Leafs. Ed Belfour was the work-horse on that team, which didn't allow Kidd to play much, which showed by his 19 games in the 2002-03 season. Even in those games, Kidd was suspect, going 6-10-2 with a 3.10 GAA and .896 save percentage. Kidd would see less time in the 2003-04 season, playing only 15 games, but with a better record of 6-5-2, but worse GAA at 3.36 and .876 save percentage, which would end up seeing Kidd lose his back-up role to Mikael Tellqvist. Kidd played one game in St. John's in the AHL, winning it and only allowing one goal. Kidd would go back internationally, but not of his own doing. After waiting out as much as he could, Kidd went over to Europe in January of 2005 playing for HC Orebro 90 of the Swedish Third Division. Kidd played eight games with two shutouts and a 2.37 GAA. In May of 2005, Kidd signed with the Hannover Scorpions of the German Elite League, playing 45 games for them and going out with a 2.75 GAA and .907 save percentage, but no record is given, nor have I found them. Though Kidd hasn't announced his official retirement, he hasn't been on a team since the end of the 2005-06 season with Hannover. Kidd has moved on, it seems, as he now owns the Mountain Bean Coffee Company, which has three locations throughout Canada. Kidd never had it real easy in his career, but was able to perform very well under less than desirable circumstances. He had Junior success, International success, and minimum NHL success, but he did what he could with what was handed to him. He wasn't always on the best teams, but he always gave his teams the chances to win and chances to succeed. He just never seemed to get the help he needed. For all the FOHS Live Blog excitement, check out the replay of it with all the fun and randomness below. There was plenty of drunkenness, Ellen Page drops, Chara-bombs, Julie Gaffney drops, and just a regular FOHS gig, but in type form. Plenty of cursing, so if you're sensitive-- yeah. As far as the game itself, the first period was a tease. 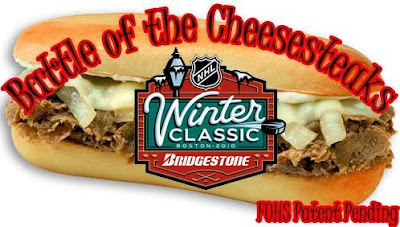 There was a great pace to the first 20 minutes and it looked like the ice was the best it had ever been in the Winter Classic priors, even with the fire extinguishers for the quick re-freeze. Yet, it was not to be. The next 37 minutes was a really slow paced affair. There seemed to be very sloppy play, many turnovers and not much flow to the entire game. However, the last three minutes and then the overtime kind of made up for the whole fact the prior 57 minutes were somewhat "meh." The old guard of Mark Recchi scoring the first goal for the Bruins to tie it up was fitting and the Marco Sturm game-winner make the Joe Thornton trade somewhat tolerable....for four minutes. The presentation was pretty alright. The unneeded Denis Leary/Lenny Clarke "Sweet Caroline" petered out quick and was a bit unnecessary. The Dropkick Murphys were alright, but I'm tired of "Shipping Up To Boston" being used all the damn time. Makes me puke a bit every time I hear it. CBC's coverage was great, with great angles, great sound, and great coverage on the sidelines throughout Fenway Park with Elliotte Friedman. As a whole, it was another great production by the NHL and showed this thing could work. First of all, I don't think that a second game is needed or wanted by the NHL. This is a special thing, two teams get the pass, one venue is focused on and the story continues. If you add a second game to it all, I don't think you'll have the same allure to the game that you do now. The hype would be a little killed off and you would want to cut it back to just one in the end. The NHL has to be careful when it comes to how to deal with this in the future. Second, the teams need to be picked properly. While there are plenty of Capitals fans who though their team would be better suited and create more scoring-- is that always the best answer?? Who's to say they would be the run-and-gun team out in the elements?? I think the fact they would be not used to outdoors would be a hinderance to it all. If the Capitals are going to be in a Winter Classic, the odds are the game will be with a Western Conference team, like Minnesota or Colorado to get the fans to venture out there and give the Western teams (West of the Mississippi, that is) more exposure to this whole ordeal. I would say the Winter Classic is a success again, but not in a landslide as it has been. There was something to this game that wasn't right after the first 20 minutes and maybe the conditions were in effect, but it seemed to slow down when the second period started. We'll have to see what the NHL does with this event next year and then talk about how the teams should be different and venue should have been somewhere else.